August 13 – A Long Day! 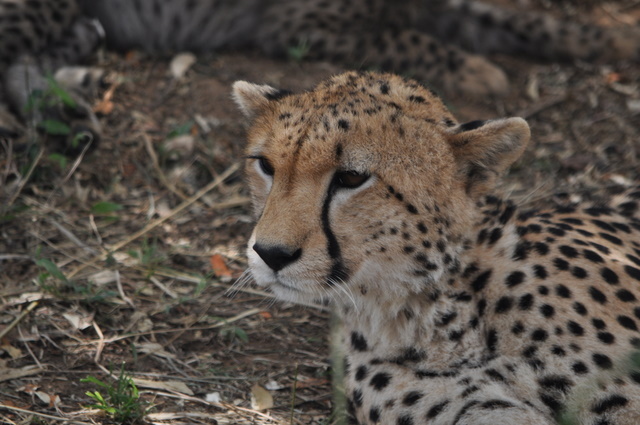 When you do your first 10 hour game drive it is totally invigorating, then when you do your second 10 hour day it is still engaging, but the third day is just a long day. We continued to see animal after animal and headed to the river straight out in the morning to see the wildebeest crossing again. It took us 3 ½ hours to get to the river and there were only a few animals around. Our driver called some friends and they told him that there was a big crossing about 60-90 minutes away so off we went. All totaled we were in the car for about 5 hours before we parked to see the zebras and wildebeest cross the Mara River. 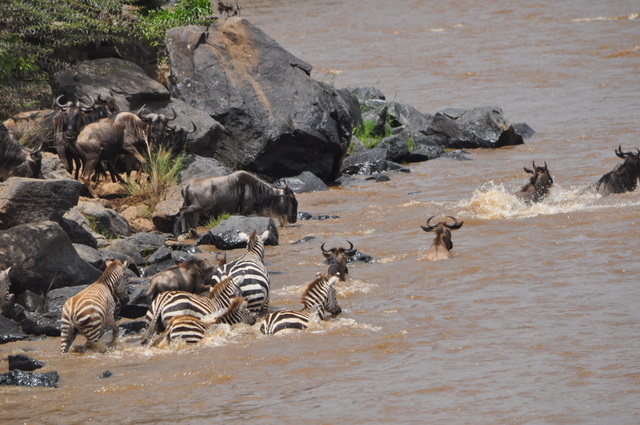 We watched for over two hours and saw a few crocodiles swim right past the zebras and wildebeest. We were waiting for a kill but we didn’t see one. There were at least 10 crocs within ¼ mile of where these animals were crossing but they must have all been full, no one attacked the hundreds of animals that crossed the river. 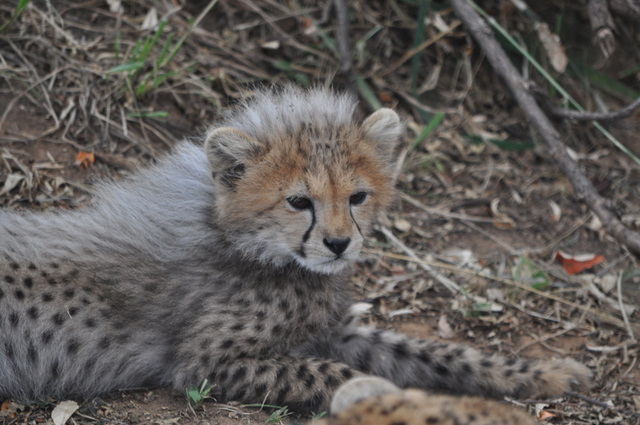 On our drive out we saw the cheetah with the four cubs and got some really great pictures. In addition, we spotted our first leopard, leaving the rhino as the only main animals we have yet to spot. On our way back we saw a pride of over 10 lions resting in the bushes and tons more zebra, wildebeest and antelope. David tried to reduce our ride home so we exited the park near the river and drove on side roads for the majority of the ride back. All totaled we were in the car for 10 hours again and the sun was hot. Tomorrow will be our last day in the park. We have a 4 AM wakeup call for our balloon ride then we will come back to the camp for the afternoon. 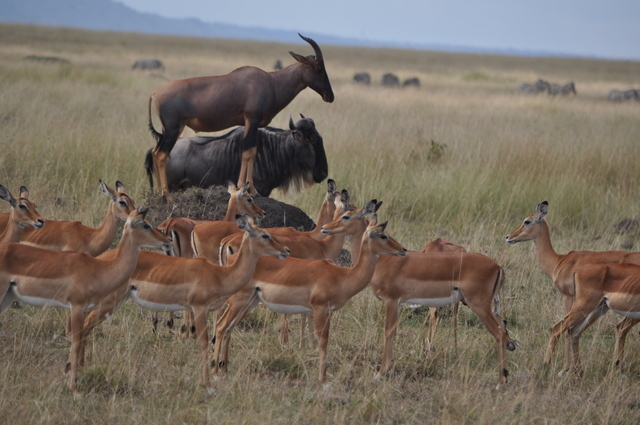 We will end our trip with an evening game drive in the conservancy, so that should do it for our animal watching. This trip has been more than I imagined, and I had some pretty high expectations. The weather has been absolutely perfect in Kenya. We have not had any rain and the clouds in Masai Mara have been breathtaking. As for future trips, I have always said that once I go someplace it is time for a new destination next time. As for Africa, I am not sure I need another safari but I can see myself coming back to Uganda and/or Kenya for my non-profit efforts. The need for the knowledge and experience we have is deep and most of the people I have talked with would like our assistance. My biggest questions still lie around what is best for their culture. I understand what we have accomplished in the west, but will that make their life that much better? Is industrialization what they really need or are they better off in some ways without us? Lots of questions without any answers just yet. Still lots to learn, but a great start on this portion of my journey. This entry was posted in Africa Trip.